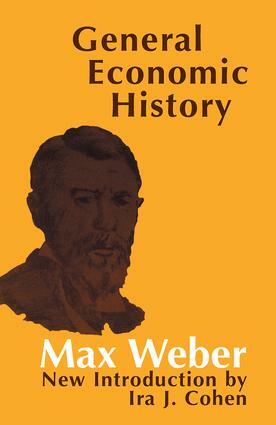 In General Economic History Max Weber focuses on the industrial enterprise for the provision of everyday wants, oriented toward profitability by means of rational capital accounting, as the institutional foundation of modern Western capitalism. This type of enterprise integrates into one institutional complex a constellation of six factors, including: formally free labor; free market trade; appropriation of the physical means of production; rational commercial practices; rational production of technology; and calculable law adjudicated and administered by the state. General Economic History traces the historical development of each of these factors from their informal rational points of origin through the feudal era to their emergence as formal rational elements in the modern capitalist industrial enterprise. The chapters on the history of modern citizenship and the modern rational state are of special significance as otherwise unavailable resources for an integrated view of Weber's work.The new introduction by Ira J. Cohen is an original scholarly work of interest to all who study Max Weber's conception of modern Western capitalism.Theessay situates the institutional and cultural aspects of Weber's view of modern capitalism in the context of his overall vision of the emergence of formal rationality in the Western world. Both aspects of modern capitalism are shown to be defined by economic formal rationality, a type of orientation which is distinct from the legal formal rationality characteristic of Weber's conception of modern bureaucracy.